This course starts in February of each year. 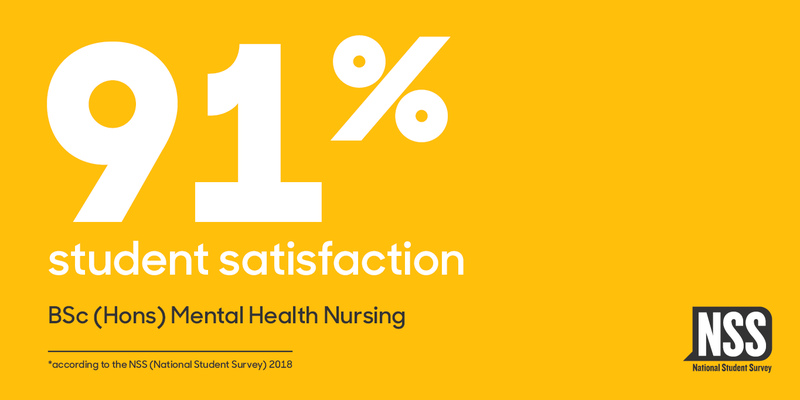 Mental Health Nursing received 100% student overall satisfaction in the NSS for 2016. This course includes clinical placements to gain practical skills and experience. The team works very closely with local practice partners and service users who are involved in all aspects of curriculum development, course delivery and collaborative projects to support students. The programme is delivered by a team composed of Mental Health Lecturers from a range of clinical backgrounds including specialist practitioners and therapists. There is 100% employability within the local trust. Mental Health Nursing students will be encouraged to develop the skills of independent learning, critical analysis, leadership, management and decision making. Students develop the knowledge, values, understanding and skills required to care for individuals to enhance recovery from mental illness and promote mental health wellbeing. Mental health nursing means working with individuals within a close professional relationship to help them achieve self-care and independence. This is a development process for the person being cared for and requires that the nurse has the highest levels of interpersonal and intrapersonal skill. Personal insight and emotional maturity are essential characteristics of the qualified mental health nurse. This course aims to develop both as essentials to effective practice. The Department of Nursing Studies is committed to embedding the NHS Constitution Values into everything we do; they define the behaviours and expectations of all our staff and students underpinning the work we do in the university and in the practice setting. This course offers students the opportunity to focus on the specific health needs of service users and their family/carer(s). The nature of nursing means that students will be involved in working with the variety of people who access the services provided by the health care system. This will range in both the age of the patient and for a variety of reasons, either short or longer term mental health experiences and with the associated complexity of physical, social and emotional needs. Each semester consists of 50% practice and 50% theory. The focus is to develop core skills and knowledge on meeting the needs of service users and their family/carer(s) as well as promoting health and wellbeing. Emphasis will be placed on keeping the service user at the centre of care delivery by supporting them to make informed choices and promoting individual recovery and wellbeing. A range of interventions and approaches, that address a wide range of short, acute and longer-term health conditions and that are used by both nurses and other members of the wider health and social care professional team, will be considered. The focus of the first year will be the development of the essential knowledge skills and value based attitudes necessary for the student to contribute to the plan of care for individuals and their carers in a range of settings. These foundations of nursing practice will be learned through observation of and participation in care delivery supported by a suitable mentor and other appropriate members of the multi-professional care team. The focus of this module is to introduce the student to the experience of higher education and the theoretical and practical knowledge that underpins mental health practice. Practice is determined by the quality of the relationship the nurse has with the service user and the primary aim of year one being that the student may learn to provide a significant contribution to the delivery of a plan of care. Deeper knowledge of the sciences underpinning the rationale and the justification for care and the arts of mental health nursing are reinforced with the cognitive skills needed to make decisions as to care need, exercise judgment as to priorities in various contexts and justify outcomes. Within this module the student will develop the skills, knowledge and behaviour required to assess plan, implement and evaluate comprehensive, evidence based care for increasing numbers of individual patients/service users and their family, carer(s) in a variety of settings. The student will be working with increasing levels of independence and clearly demonstrating a potential to work autonomously on completion of this year. The purpose is for the student to extend the knowledge and skills that have allowed them to make a significant contribution to the plan of care. This module contributes by extending and deepening the students’ knowledge and further developing the cognitive skills required to assess, plan, implement and evaluate the care of small numbers of individuals in a variety of settings. The focus of this module is continued development and consolidation of the primary knowledge and skills that are required to deliver planned, progressive and individualised care to small numbers of persons in a variety of contexts. The module will also consider the role of systematic investigation and the underpinning research that is used to improve the quality of service and how national policy, local organization and social issues influence the provision of mental health care. This module will prepare the student to make the transition from student to registered nurse, capable of managing the care of small groups of patients/service users and leading, supporting appropriate members of the care team. The knowledge, skills and value based behaviours developed in years one and two will be extended and refined and applied with those required to achieve successful leadership and management. This module will extend the student’s understanding of core concepts and the principles of effective leadership, knowledge of service improvement strategies and lifelong professional development skills. High quality and innovative, ethical and contextually sensitive care will remain the main focus of the module. The dissertation module enables students to consolidate their learning throughout the curriculum, and apply the principles of research in an area related to practice enquiry. It further develops students’ understanding on how evidence is generated, retrieved, critically appraised and applied to practice. As a student progresses to registration they will be able to use clinical reasoning skills to guide and inform best practice decisions, and develop evidence-based practice for service users. Mental Health Nursing students are very employable and gain a range of skills throughout their degree. Graduates can progress in to a variety of careers including those in community and hospital settings, education and research. There are numerous opportunities for continued professional development and progression to higher degree study. "I was attracted to mental health nursing because of the values of personal self-determination, respect for the individual and the ethical practice that it promotes. Although psychiatry has had its uses it has not always promoted mental health. Contemporary mental health nursing however does and it in this area I want to work after I qualify. This course is equally as demanding as it is rewarding, the more you put in the more you get out. I have learned so much about people and like myself and them so much more as a result." Peter is at the end of the second year of the programme. The clinical skills laboratory and the use of sophisticated computerised technology enable students to practice clinical skills in a safe environment. 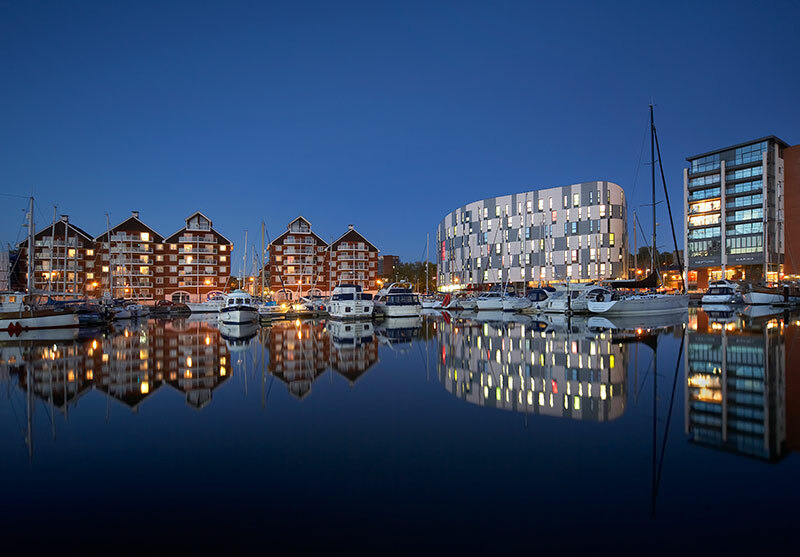 The course delivers a blended approach to teaching and learning at the Ipswich Waterfront Campus. Other approaches to learning include; clinical skills teaching; use of a virtual learning environment; large group teaching; small group teaching, presentations and private study. There is a range of clinical placements across Suffolk including acute inpatient units, psychiatric intensive care, a forensic unit and a range of community teams. Theoretical sessions are based at Ipswich for all mental health students. All clinical placements throughout the three year course are person focussed. When working in practice you complete a 37½ hour a week, this includes early shifts, late shifts, long days, weekends and night shifts depending on where you are placed. Please note: You are expected to work on placement during the whole seven day week period. Shift hours vary according to where you are based. You will be expected to work some night shifts across all three years.